Director John Favreau says that he wants to see Iron Man's arch enemy the Mandarin in Iron Man 3. For nearly as long as there's been an Iron Man, there's been a Mandarin fighting against him, but so far, the movies had steered clear of the character, in favor of Iron Monger and Whiplash. But if director John Favreau has his way, that will change with Iron Man 3. "You have to do The Mandarin... The problem with The Mandarin is, the way it's depicted in the comic books, you don't want to see that," he said. "He also has ten magical rings, and it just doesn't feel right for our thing, so it's either tech-based or the rings are not really rings... But maybe with Thor and all those others you'll introduce magic to that world and it won't seem so out of place." 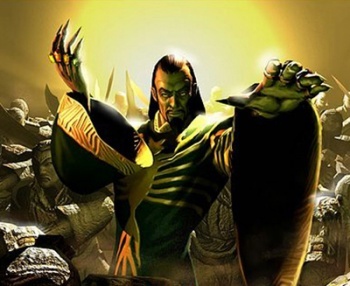 I'm hoping that the movie will retcon the Mandarin a little and make his rings technological. Even with Thor on the way, adding magic into a franchise that had been all technology tends to be an awkward fit.